whose motor has been completely gone through and had NEW parts installed (the list follows). The smooth power-band of the vintage TS motor makes it an ideal 2 cycle Short Tracker. Here's your chance to get into the sport for a very cheap price and have some fun turning left. I only ran one 9 Event Summer Series afterI built the bike and now its for sale. 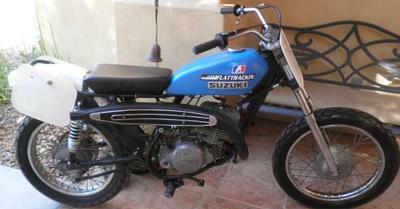 My asking price for the flat track bike is a very cheap $850. If you're interested or have questions you are welcome to call me or text me at (480) 329-5842 and don't forget to mention that you found this ad on Strike Lightning's Gogocycles Used Motorcycles for Sale .